Happy Halloween (and Good Luck with NaNoWriMo)! Happy Halloween to all! And at midnight tonight, NaNoWriMo starts – Good luck to Harry Heckel, Wayland Smith, Brad White, and all the other writers out there! Read an E-Book Week is coming to a close, but you can still get three of our books free through the promotion on Smashwords, and a fourth for half off, until March 9. In the Service of the King and Souls of the Everwood by Harry Heckel and Servant of the Muses by Brad White are both free – use coupon code “RW100” at checkout. To get In My Brother’s Name for $1.50, use coupon code “REW50” at checkout. Enjoy! 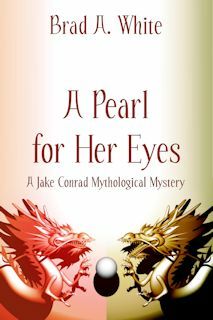 Jake Conrad is coming back with an all new mythological noir mystery! The new book is A Pearl for Her Eyes, and should be available by the end of March. We’re excited to announce that A Pearl for Her Eyes will also be available in print. Sorry it’s been a little quiet here, but we’ve been busy! Souls of the Everwood by Harry Heckel is now available through Smashwords and Amazon. The print version has also been proofed and should be available through Amazon within the next week. We’re also hard at work on the print versions of Broken Faith and In My Brother’s Name – watch for those within the next 2-3 weeks! Servant of the Muses is now available for purchase at DriveThruFiction.com. Servant of the Muses by Brad A. White is now available at Apple in the iBookstore!